Per sign at gate: Monday through Sunday, 8:30-4:00. Cemetery Office at St. Patrick Cemetery, 143 City Park Ave., 504-488-5300? 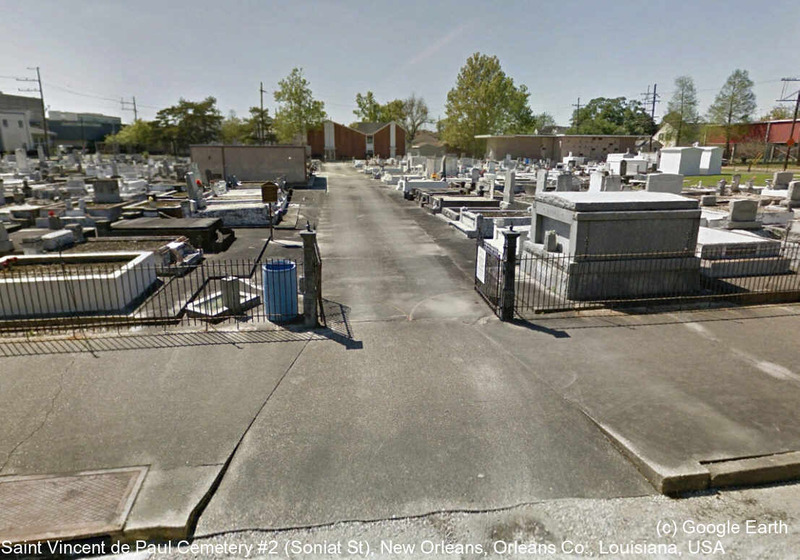 St. Vincent Cemetery 1925 Soniat Street, New Orleans, LA70115 (also known as St. Vincent de Paul Cemetery #1) comprises 2 city blocks in the Uptown Neighborhood of New Orleans. The original section is bounded by Soniat St., S. Saratoga St., Dufossat St., and Loyola Ave. The second section encompasses the adjoining block (sometimes referred to as St. Vincent #2) this portion of cemetery is bounded by Soniat St., Loyola Ave., Dufossat St., and S. Liberty St.